I’ve always been fascinated with an odd little sub-genre of 17th century Dutch still life painting known as Forest Still Lifes. These paintings are often very rich in symbolic meaning and offer a fascinating array of plants, flowers, fruits vegetables, snakes, lizards toads, birds and so on. 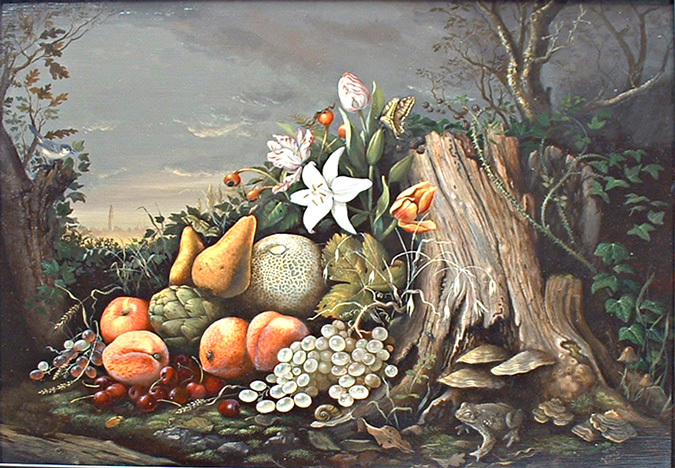 I’ve always particularly liked the works of Rachel Ruysch, Otto Marseus van Schriek, and Abraham Mignon. I drew my inspiration from them and others of their ilk in creating this painting. The tiny church steeple in the background depicts the Martinitoren in the city of Groningen in the northern Netherlands.